Because vodka always tastes better cold. This Stone Vodka Shooter Set will let you serve your vodka in a way that will send a chill through your guests. Simply pull the shooters from the freezer, pour the vodka, and enjoy a chilled shot. These two-ounce shooters come with a rustic wooden serving tray, making it easy and stylish to transport from freezer to table (even if you already enjoyed a few too many). 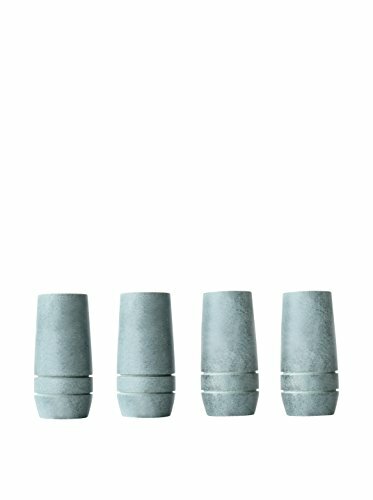 Made from a gray-blue soapstone, these shot-glasses exude style and class. Normally, I would only expect to see them in an expensive, specialty vodka tasting bar but, you can have them in your own home bar or man cave. Oh, and don’t just assume they’re for vodka (though vodka tastes great from them). They’re also great for whiskey, bourbon, tequila, and other liquors so, if you run out of vodka, the party doesn’t have to come to a stop. If you prefer drinking your liquor out of a glass, check out these Stainless Steel Whiskey Stones. Dimensions” 3.7 x 3.7 x 4.5 inches. 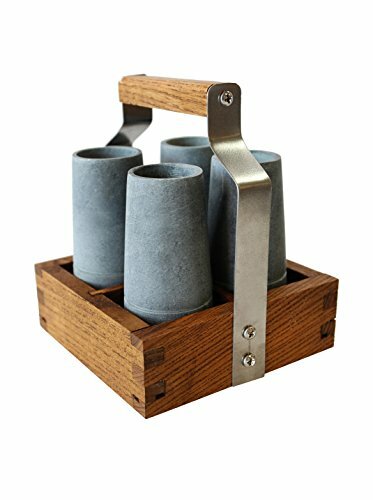 Materials: Soapstone shooters with Ash wood caddy. Includes a set of 4 stone shooters and carrying caddy. Also great for whiskey, bourbon, tequila, and other liquors. Freeze the shooters for a few hours, then pour and serve.